If you like the cool creamy taste of a banana split you are going to LOVE these Banana Split Cream Puffs. 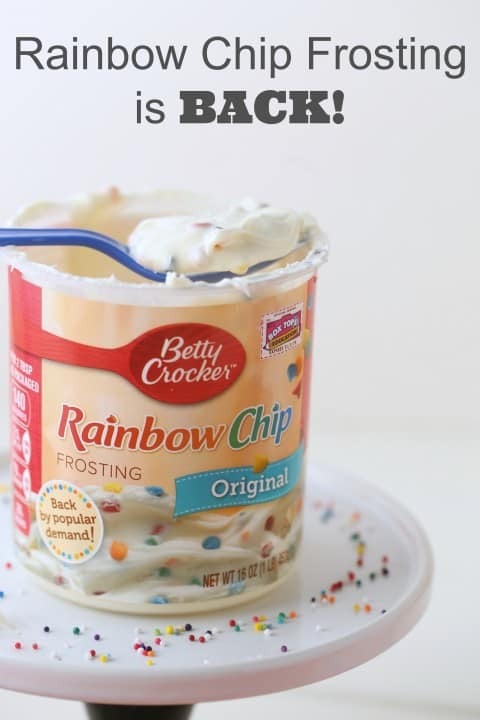 I’m happy to announce that Betty Crocker is re-releasing their Rainbow Chip Frosting, yes that fun favorite will be back on the shelves for you to purchase. This post for Banana Split Cream Puffs is sponsored by Betty Crocker, all opinions are my own. Little did I know she was treating me to one of the best gifts I could receive. I love food as a gift and she knew me WELL! I loved that there was so many of them, and I didn’t have to share. She told me so. I was reminded of cream puffs the other day and I thought how fun it would be to make them and fill them and make them remind everyone of banana splits. Best part is these won’t melt! then drizzled melted chocolate placed the lids on the cream puffs and topped them off with rainbow chip frosting and some sprinkles. Cream Puffs are made by a mixture of butter, flour and eggs. Absolutely nothing complicated, right? 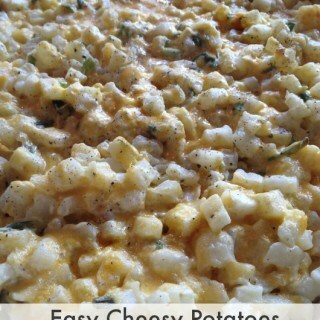 If you haven’t made them before, here is the perfect opportunity. The other name for the mixture to make cream puffs is called Choux Paste. Yes it does remind you of paste while you are prepare it, so it’s a great little name that correctly describes the mixture. 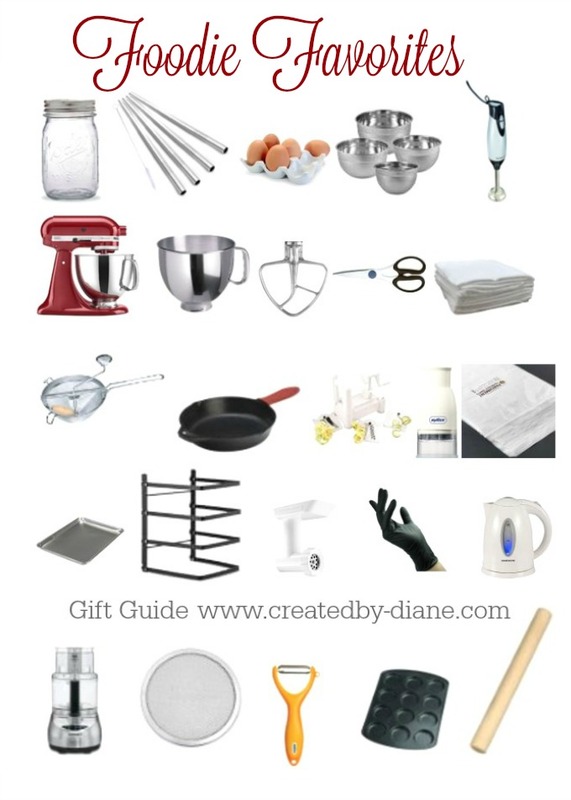 Have everything ready before you being filling the cream puffs so they all look similar. 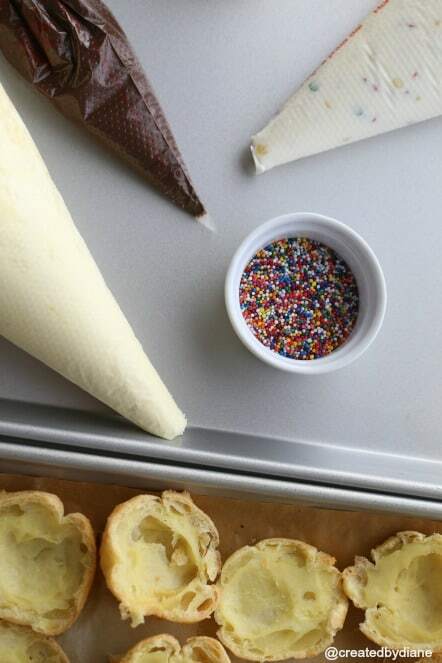 Disposable pastry bags work really well for the filling , melted chocolate and to add the frosting on top of the cream puffs. In medium saucepan, bring water, butter salt and sugar to a boil on medium heat. When butter is all melted, remove pan from heat and add flour and mix vigorously with a wooden spoon until well blended. 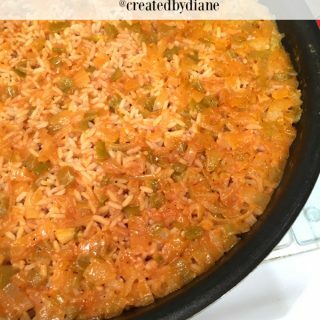 Return pan to medium heat and stir until the mixture pulls away from the sides of the pan and forms a ball. Remove pan from heat and allow it to cool 5 minutes. Add (4) eggs, one a at a time beating with wooden spoon after each egg is added. Use a two tablespoon scoop to share the batter into balls and place them on a parchment lined baking sheet separated evenly so they bake up nice about 2 inches apart. In a small dish mix remaining egg and a one teaspoon water and brush over ONLY the TOPS of the cream puffs (be sure it does not drip down the sides or the puffs won't rise properly. *Just a small amount is all that is needed to get a crisp top. Bake at preheated 425 degreees oven. 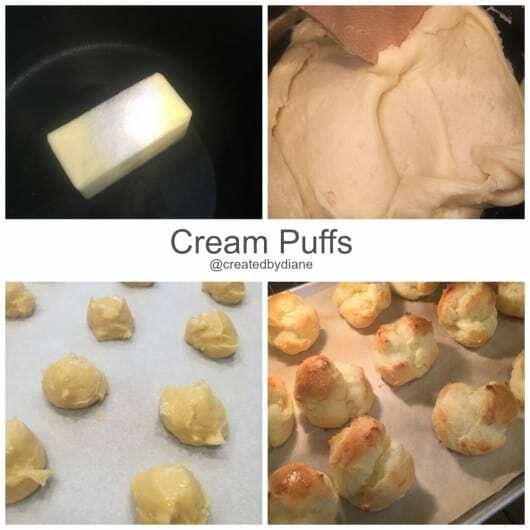 Bake for 15 minutes, then reduce the heat to 375 degrees and cut a small slash in the sides of each cream puff to let out the steam as they finish cooking and dry out the insides a bit more. Continue baking until they are golden brown. You can slice them in half and put them in the oven as well. Use cream puffs within 24 hours. Makes about 30 cream puffs. Mix both pudding powder and heavy cream together until it's smooth and creamy. 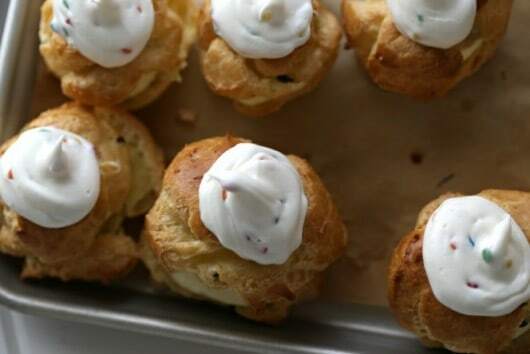 Place the filling in a piping bag (with a dime size hole) to fill the cream puffs neatly and easily. Place a small glass bowl with the candy melts in the microwave for 30 seconds mixing to be sure it fully melted. Place cream puffs lids on top and then add a dollop of Rainbow Chip Frosting and add a few sprinkles. *If you want the frosting to stand up ofter it's piped on the cream puffs, mix 1 cup powdered sugar with the frosting, it will make it thicker. The creamy filling and super fun frosting on these made these a huge hit with everyone. I just LOVE how cute these cream puffs are. Rainbow Chip Frosting it’s coming back! There are many, many people happy about that. There have been TWEETS, Petitions, and even a facebook group that has convinced Betty Crocker to bring back Rainbow Chip Frosting. The power of the internet is amazing! This is a sponsored post for Betty Crocker, as always all opinions are my own. Saw these on your Instagram and I wish I could just bite into one now! Cream puffs are so good aren’t they?! They look beautiful! And just would melt in the mouth.. Yummy! Oh goodness, those look insanely good. Who doesn’t love banana splits? I adore cream puffs but I’ve never made them. 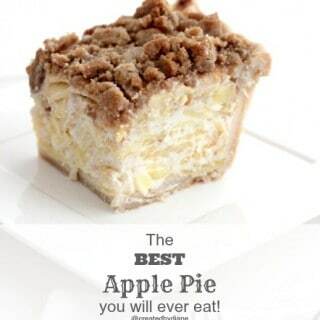 I need to change that, and I love that you made the banana cream pie filling! 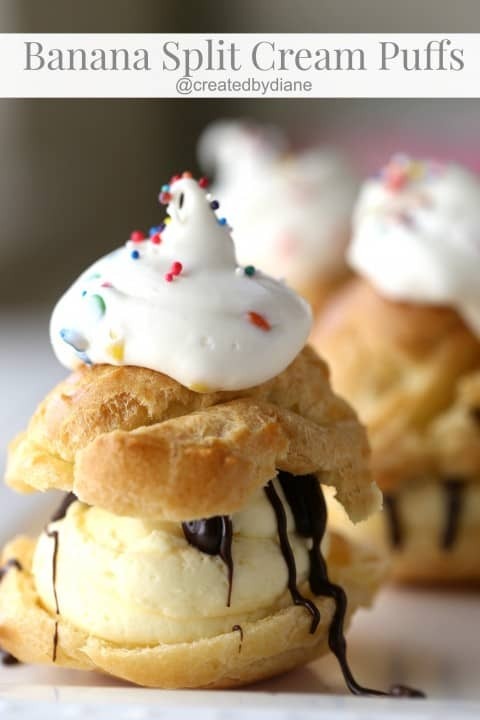 These cream puffs are adorable! 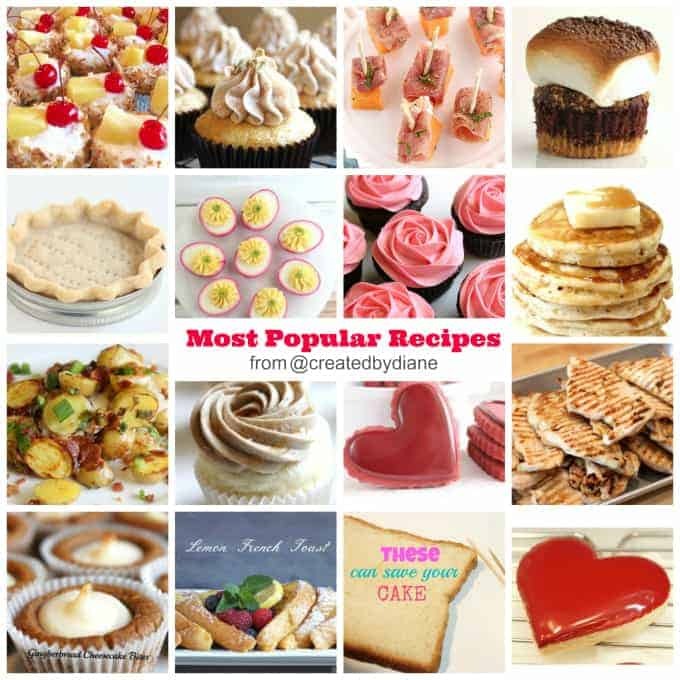 Love the banana split twist and especially that rainbow chip frosting!!! I love these cream puffs and I love that colorful icing! 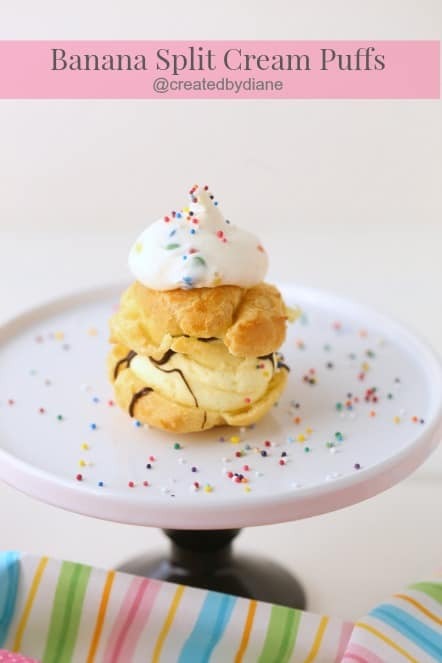 I can’t believe I’ve never made cream puffs- they look so good. And how yummy is that rainbow chip frosting?! Oooh, the perfect summer cream puffs! And the rainbow chip frosting pushes these gems right over the top! These sound dangerously delicious!! 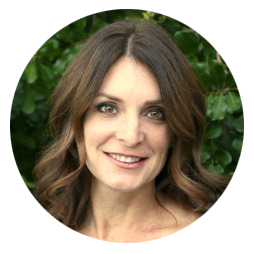 We were looking for something to take to a girls night soon….i think I just found it! Oh…it’s back. I have to find it at the store…! I am so glad I clicked on this post. What a gorgeous way to celebrate. These look SO cute! Perfect for a party! Okay next time I made cream puffs, they will for sure include some rainbow chip frosting! YUM! Thanks for the puff recipe. Approx how long after that 375° setting do you bake them for…til slightly golden? I have a similar recipe from Betty crocker(1986 Desserts Betty Crocker Recipes for Today) but I doesn’t include sugar. I love it and have been using it for year. Next time I wiill try it with sugar. Btw, do you have a recipe for just custard filling …or would this filling be just as tasty without the bananas. Yummo! Continue cooking them at 375 until golden and the insides are on the dry side. I started checking mine at 5 minutes. Here is a recipe for pastry cream which is a creamy custard type of filling which would be delicious in these. 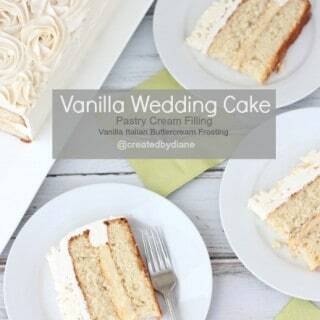 You could use pudding mix to make it, vanilla or chocolate mixed with heavy cream work out well.